EDP Spring Classic – CANCELLED! NJTravelSoccerBlog.com wrote about the weather being a major factor in March tournaments and thanks to our midweek snow storm, we have lost an entire weekend event! The fields from Fort Dix to Cohansey were deemed unsuitable for play following a second dusting of snow last night. EDP issued an admirable statement regarding the cancelled event which you can see below. The good news is teams will be receiving a 100% credit to another tournament which is a better solution than years past. at all venues. There will be no games this weekend. Our crews had been working hard all week in an attempt to get the tournament off as scheduled. However, recent weather developments and worsening forecasts for the upcoming weekend proved too much to overcome. At Tuckahoe Farms in Hammonton, the standing water and ice has not been draining as hoped due to ongoing frigid temperatures and frozen ground conditions. We had planned to move the Joint Base / Fort Dix venue games to Cohansey and Pittsgrove fields, but those fields were hit with fresh snow overnight, preventing the necessary field preparation. Weekend forecasts have also been steadily deteriorating, making the necessary drying conditions unlikely. Our facility hosts have withdrawn the use of their facilities, citing unplayable fields. EDP is committed to the safety of its players, and agreed with the mutual decisions reached all around. 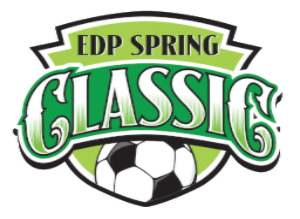 EDP will post a 100% credit for each team’s entry fee for the Spring Classic, which can be used for any new applications to an outdoor EDP event over the next 12 months. Our posted online Application Info and our Regulations allow for the option of a 70% refund in the event of a cancellation, in lieu of the 100% credit. Any team opting for the 70% refund in lieu of the default 100% credit, please advise us at joe@edpsoccer.com. Formalities covered, we conclude with an expression of our deep disappointment over what really matters: that an opportunity to play or watch the “beautiful game” is being denied us this weekend. Hopefully the rest of the calendar will treat us more kindly!